Former NATO Leader: "The United States Must Be the World's Policeman"
In an Op-Ed in The Wall Street Journal last month, Anders Fogh Rasmussen, a former NATO Secretary General said he knows “how important American leadership is” and that the “world needs such a policeman” to maintain peace and order. Rasmussen expressed his concerns with Vladimir Putin, the President of Russia who he feels is “challenging the world order that the U.S. created so successfully after World War II.” Rasmussen said that during an encounter with Putin the Russian leader told him that NATO should be disbanded because it “no longer served any purpose.” Since the time that Putin rocked Rasmussen with his comments in 2009 Russia has invaded Ukraine and began military action in Syria. Anders Fogh Rasmussen with Vladimir Putin. The former NATO Secretary General went on about the poor state of the world. War torn regions and collapsing nations have turned into terrorist breeding grounds, Russia is threatening to take over Eastern Europe, and countries in Asia such as China and North Korea are war hungry and ready to launch nuclear attacks. Secretary Kerry with European and NATO leaders. “America alone has the credibility to shape sustainable solutions to these challenges,” he said. Rasmussen argued that the reason that the United States is the most fit is not a matter of means, but a matter of morality, adding that America would not come into controversy and halt chaos for the sake of power, but for the sake of peace. “The Obama administration’s reluctance to lead the world has had serious consequences, and none is graver than the behavior of Mr. Putin,” Rasmussen said, before weighing in on the upcoming United States Presidential election. 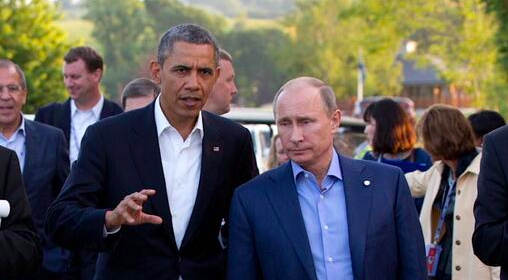 President Obama with Russian President Vladimir Putin.